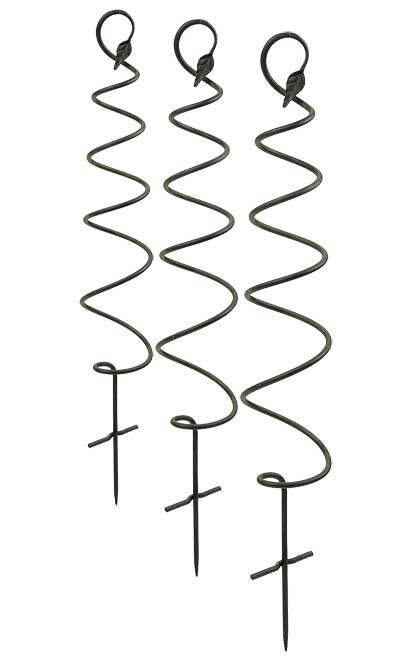 Offer whimsical support to a few of your favorite crops or flowers with these Achla Black Spiral Trellises. This set of 3 spirals adds striking style to your garden, while bringing needed support to your peas or honeysuckle. Each is crafted from hardy wrought iron, and their black color adds a timeless finish. The sturdy rod spirals upward, becoming smaller toward the top, and culminating in a leaf shape to enhance the theme. A pointed, 5.25" long base rests beneath the 6.5" wide, horizontal rod, keeping the unit stable when inserted into your soil. This also allows the spirals to be placed in pots greater than 7" in diameter, for growing fantastic indoor topiaries. The powder coating on each unit protects it from the elements, while its bevy of curls easily supports climbing plants. Lend a modern hint to your sunroom or garden with these Black Spiral Trellises. Note: This case pack includes 3 of the Achla Spiral Trellises, Black, 45"H.